A new year finds me having to deal with a new job. I’m really looking forward to it. Sorry for not posting … haven’t been cooking as much. Or more likely, a piece of broiled fish and a bowl of rice or salad isn’t nearly as blog-worthy as a pumpkin gratin. That being said, here are a few pix from a dinner I had at a place in midtown last month. 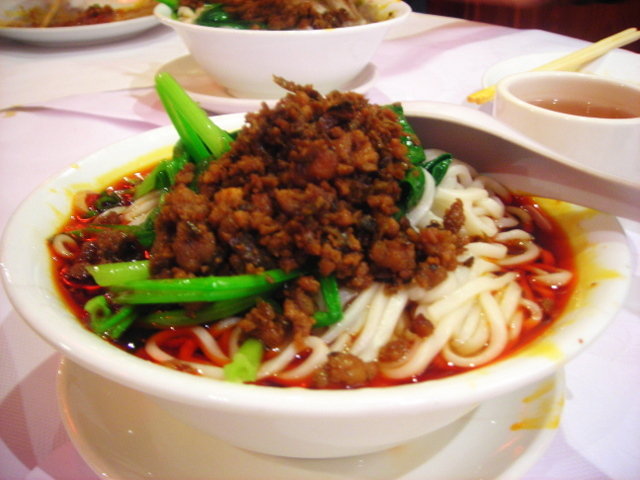 Dan-dan noodles is the name given to thin rice noodles topped with minced pork with bits of Sichuan peppercorn in a fiery, spicy, slightly sweet and salty sauce. Very occasionally, water spinach or Chinese broccoli might make an appearance. The version at Szechuan Gourmet is somewhat more oily than at other Sichuan restaurants in New York, like Spicy and Tasty and Wu Liang Ye. Hmmm…I’m going to have to visit again soon, you know, just for a second taste comparison. Not much to say here. 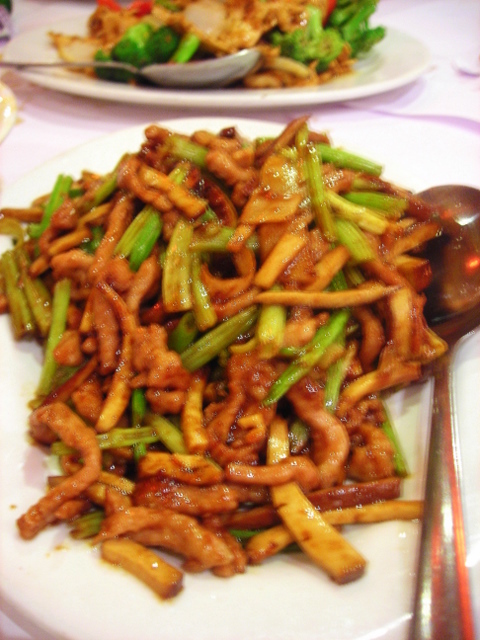 Typical Chinese food — meat, tofu, maybe celery? with a spicy sauce redolent of Sichuan peppercorn. Someone in our party claims it made them a convert to tofu so it could’ve been a winner. Me, I’ll eat most things. (Maybe the subject of my food dislikes could provide interesting fodder for a future post.) Otherwise, completely uninteresting. Apologies again for the blurry pictures. I think we ordered eight dishes for five people. There might have been some beer and wine too. It came out to $120 with tax and tip, or $25 per person. 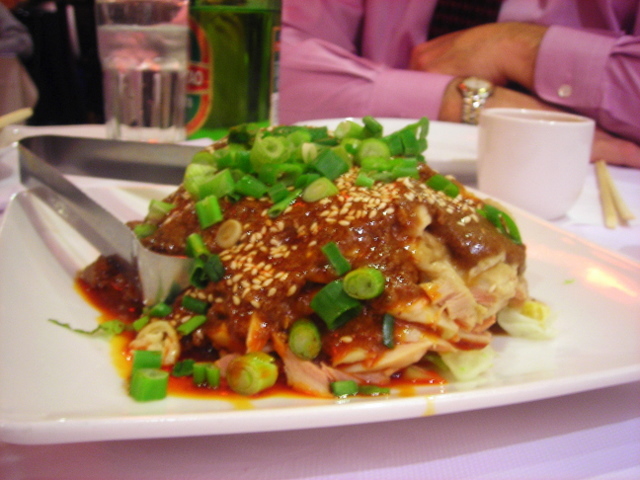 Szechuan Gourmet is located at 21 West 39th Street (5th Avenue) in midtown Manhattan. 04 Jan	This entry was published on January 4, 2010 at 6:32 pm. 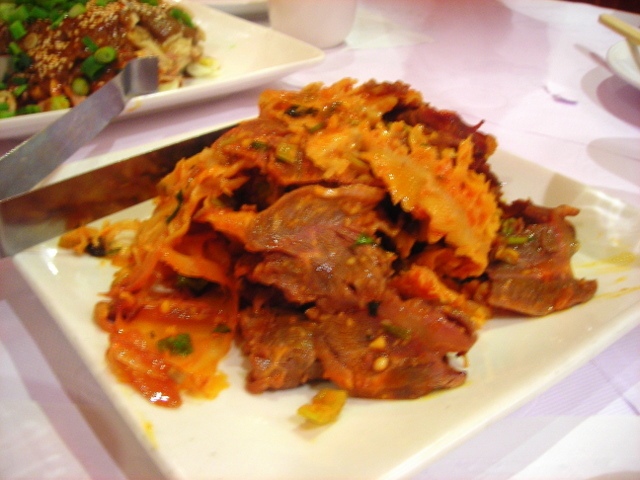 It’s filed under Chinese food, food, general, New York City and tagged cheap and tasty, dinner, New York City, restaurants, Sichuan cuisine. Bookmark the permalink. Follow any comments here with the RSS feed for this post. Any recipe with noodles in it gets my high marks! Its a tough market out there. Congrats on getting that job! Next time I’m in the midtown area of New York, I may just pop in the spot for some of that Dan Dan noodle!